Updated March 15, 2004! Convert AC3 audio to WAV with the AC3 ACM Decompresser. Updated May 2, 2003! Added how to convert video with 5 channels(AC3/Dolby Digital 5.1 Audio) to WAV. Tools required: Virtualdub or Virtualdub-MPEG2 for MPEG2(SVCD,DVD) video and maybe AC3 ACM Decompresser (if your audio source is AC3). Read the Problems section if you have any problems. 3. Check if the source has 2 or 5 channels(AC3). - If the source has 2 channels just continue here below. - If the source has 5 channels(AC3) then you must install AC3 ACM Decompresser. Close Virtualdub and install it, then open the video again and continue here below. 1. Select under Audio->Full processing mode. 3. Set the Sampling rate to 44100Hz (if you are going to make a DVD later, set it to 48000Hz instead). 1. Save the wav by clicking on File->Save WAV. 2. Save it to a new wav file. The wav will be a huge audio uncompressed video file(about 10 MB/minute) if you haven't selected any compression like mp3. If encoding to VCD,SVCD or DVD then launch your encoder and select the wav as the audio source. If a window popups and says that Virtualdub has detected an improper VBR stream just click OK but be sure to save to WAV. 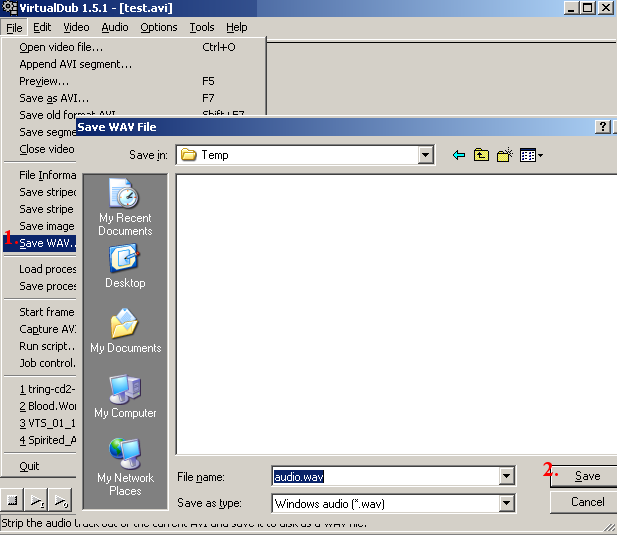 If you have problems extracting the audio using Virtualdub try use AVI2WAV or Goldwave and open the avi and save the audio to wav. 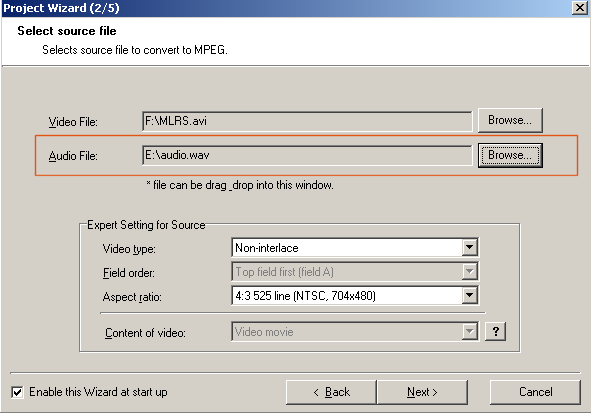 If your video source is MPEG2(SVCD/DVD MPG files) or VOB you must use the VirtualdubMPEG2. If your source is ASF,SMR you must use Virtualdub 1.4c cause newer Virtualdub versions do not support them and the ASF codec. If you are thinking of converting to mp3 you need MP3 Audio Codec installed. 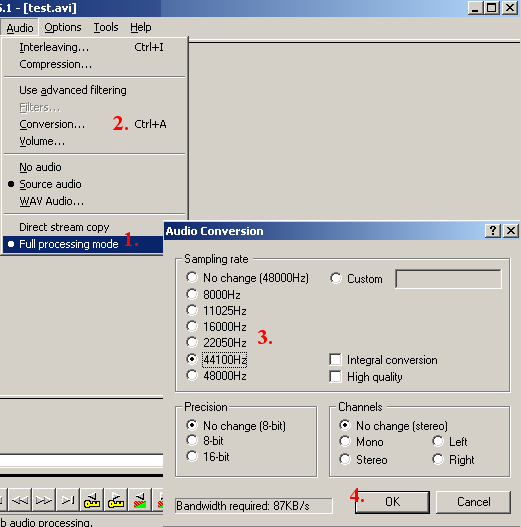 If the source have AC3 (5 channels) audio you must install the AC3 ACM Decompresser. To convert to MP3 audio or any other format select Audio->Compression and select MPEG Layer 3 or Lame MP3, you may have to install a MP3 Codec first.